As the culminating event of UC Merced Arts Week 2019, the goal of the Conference is to collaborate and to celebrate diverse educational and artistic communities by bringing together instructors and students from Merced College, Modesto Junior College, and UC Merced for a day of creative writing pedagogy, inspiration, and opportunity. We expect 65 students and faculty to participate in the conference on March 9th this year. 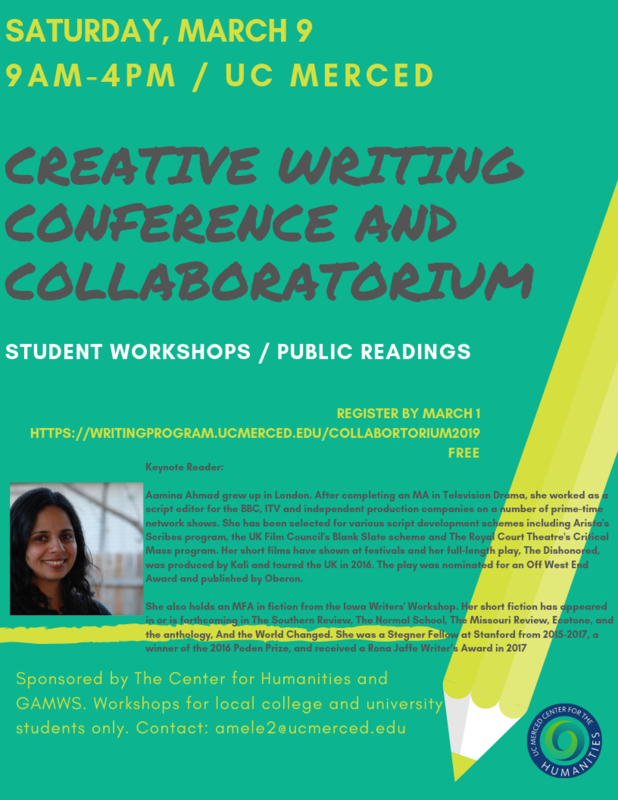 Though the conference has been offered since 2013, this year, we will partner with GAMWS to offer a breadth of multi-genre art, media, and writing workshops, thus engaging students with interests represented in both Writing Studies and GASP programs. Students from local colleges and universities may register for the free conference. The Keynote Reading is free and open to the public. This event will contribute to arts and humanities research at UC Merced, specifically around developing and sharing writing and arts pedagogy and practices among participating faculty, while inspiring students and community members to produce and perform art that explores and represents their experiences and worldviews, especially as they relate to the Central Valley and California artistic communities. Aamina Ahmad grew up in London. After completing an MA in Television Drama, she worked as a script editor for the BBC, ITV and independent production companies on a number of prime-time network shows. She has been selected for various script development schemes including Arista's Scribes program, the UK Film Council's Blank Slate scheme and The Royal Court Theatre's Critical Mass program. Her short films have shown at festivals and her full-length play, The Dishonored, was produced by Kali and toured the UK in 2016. The play was nominated for an Off West End Award and published by Oberon. She also holds an MFA in fiction from the Iowa Writers' Workshop. Her short fiction has appeared in or is forthcoming in The Southern Review, The Normal School, The Missouri Review, Ecotone, and the anthology, And the World Changed. She was a Stegner Fellow at Stanford from 2015-2017, a winner of the 2016 Peden Prize, and received a Rona Jaffe Writer’s Award in 2017. Open to the public, featuring musicians from around Merced.